It is bread week. Hooray I thought! I like making bread. Then it came to Saturday evening and I was running out of time to be able to make anything! 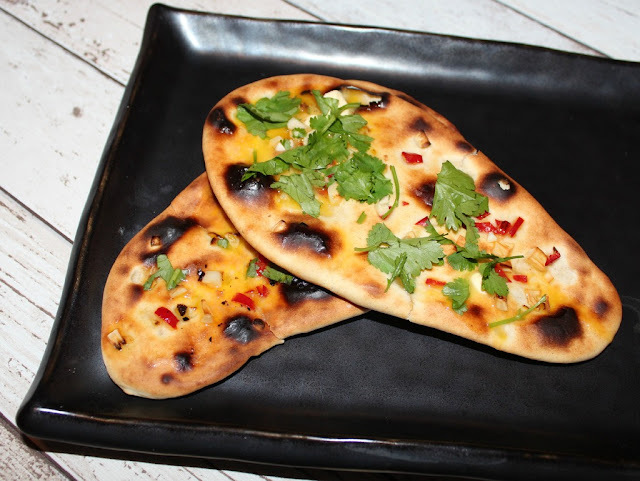 I have made naan bread before which went pretty well. So I did what any dried fruit hating person who could do with losing a few pounds would do. I decided I would have a go at baking Chelsea buns for the first time ever. This would make my raisin loving offspring happy and hopefully meant that I wasn't consuming too many calories! As I hadn't a clue what to do, I generally followed the BBC Good Food Recipe. I say generally as I used caster sugar instead of the golden variety, and had a combination of different dried fruits. So what did the dried fruit lovers of the house think? Well they liked it! Me? I picked out the dried fruit to give it a taste and liked it too. I can't help thinking that it would taste so much better with chocolate or cherries and marzipan inside. Watch this space! Mix the flour, yeast and sugar together. Melt the butter and add this and the warm milk and beaten egg to the mixture. Make into a dough adding a little water or more flour if necessary. Knead until smooth and then leave to double in size in a bowl. knead the dough and then shape into a rectangle. Add the butter (sliced) dried fruit and sugar and spice to the dough. Then roll it along its longest side. Cut the dough into 9 rounds and put in the tin. Leave for about 20 mins to rise. Bake for 10 minutes then lower the heat to 180C and bake for 10 more. Mix 25g caster sugar with some water and brush over your warm buns. Enjoy and share if you can. Click on the badge below to see what other bloggers have baked this week. 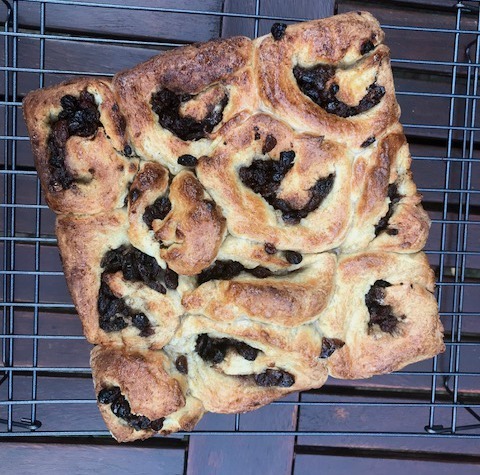 The texture on your chelsea buns looks fab. By all means add different fillings but then it not a Chelsea bun at least as far as i'm concerned. 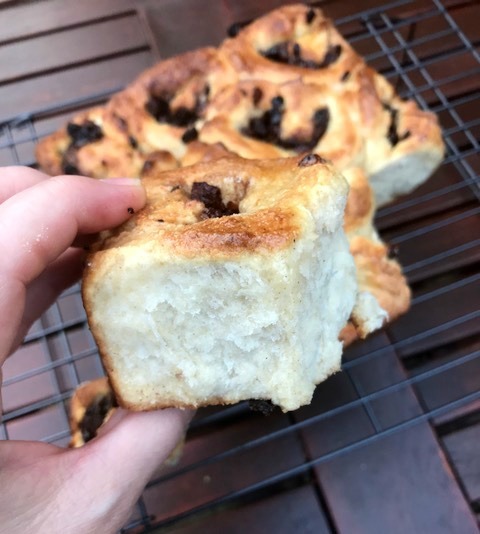 I was dreading my family wanting to make Chelsea buns this week because I knew I wouldn't be able to resist and they're not at all Slimming World friendly! I was relieved when they decided to make naans! These look yum! I think your ideas of cherries and marzipan are great, I might try those myself.